Selling your home For Sale By Owner Orange County NY is much simpler today with the advent of Agent Assisted FSBO sales. Home owners today have many more options than simply sticking a For Sale By Owner Orange County NY sign on their front yard or buying some classified advertisements on their local newspaper. We’ll explain in this article why you can’t avoid agents altogether if you want to maximize your buyer traffic and how to avoid getting scammed by flat fee MLS listings which can cause more harm than good. A traditional For Sale By Owner Orange County NY listing does not work because FSBO Orange County properties are effectively off market the moment they are listed. It does not matter whether you list your FSBO Orange County property on a popular real estate search website or buy advertisements in your local newspaper, your listing is off market because it’s not listed in your local Orange County Multiple Listing Service. Think about it, when you list a home For Sale By Owner Orange County NY on your local newspaper, you’re only exposing your property to the random segment of buyers who happened to even glance at that newspaper. Similarly, if you listed your home For Sale By Owner Orange County NY on a popular real estate search portal, the only people who will see it will be those very few who are searching without the assistance of a local real estate agent. 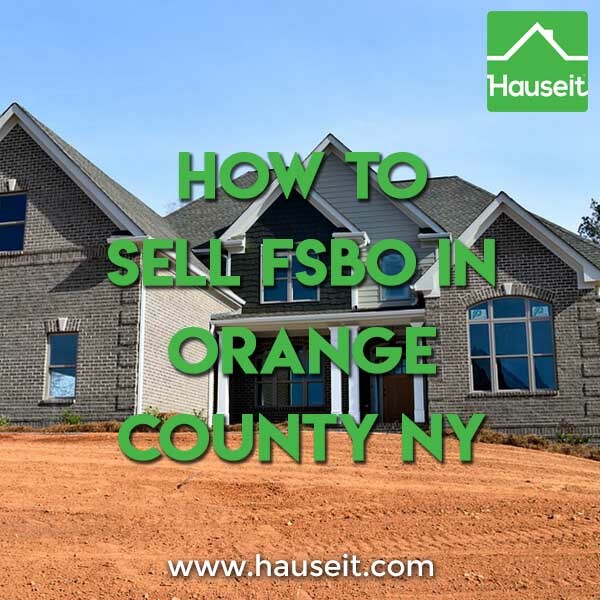 Unfortunately for FSBO Orange County sellers, the vast majority of buyers in Orange County New York are working with a local Realtor who not only knows the market but has superior information on available properties through their local MLS. Furthermore, it’s important to understand that buyers’ agents have absolute dominance in suburban areas such as Orange County New York. That’s because most Realtors will only agree to drive buyers around and help them with their home search if buyers agree to sign an exclusivity agreement, otherwise known as an Exclusive Right to Represent Agreement. This agreement not only binds the buyer to their Realtor, but forces the buyer to pay the buyer’s agent’s commission if he or she purchases a property that doesn’t offer or split commission with the buyer’s agent. However, keep in mind that in Orange County NY only 2.7%* of active listings are listed For Sale By Owner. That means the vast majority of sale listings are properly co-broked in the MLS, meaning the seller pays both sides of the commission and half is contractually promised to any cooperating buyer’s broker. This means neither the buyer nor the buyer’s Realtor will want to look at your listing and negotiate a separate FSBO commission agreement if they can automatically get paid on virtually any other listing. Think about it, obviously a buyer would prefer not to have to pay for their broker. It’s not normal for buyers to have to do so if 97.3% of all listings in Orange County New York are listed by an agent where the seller pays the commission. If the Realtor doesn’t haven an exclusivity agreement signed with their buyer, as is common in New York City, then the buyer’s Realtor won’t even dare to send a FSBO Orange County listing to their client in the first place. If they do so, they risk a potential 3% commission payday as the buyer could easily search for the property’s address and realize that it’s a For Sale By Owner Orange County NY direct deal and cut out the Realtor! *According to a proprietary Hauseit study conducted on November 7, 2017. There were 2,902 total listings for sale in Orange County NY of which only 78 were listed For Sale By Owner. Most flat fee MLS brokers are either shady one man shops or barely competent mom and pop operations that happen to have a broker’s license. This also happens to be the view of traditional brokers who view discount brokers as bucket shops who are as much a danger to consumers as they are to the brokerage industry. Unfortunately, most flat fee MLS companies don’t provide any more marketing exposure than a traditional For Sale By Owner Orange County NY listing. That’s because they either list home sellers in the wrong MLS or a MLS that’s completely irrelevant for the locale, or because they simply get boycotted by traditional Realtors. Getting listed in the wrong MLS can be infuriating, especially if you’ve just paid hundreds and sometimes thousands of dollars for your flat fee MLS listing. This scam happens often in Orange County New York when home sellers purchase expensive flat fee listing packages that end up listing their home on an irrelevant broker database for Orange County NY, such as the New York State MLS or the Capital Region MLS*. The dominant MLS that covers Orange County NY as well as the Greater Hudson Valley is the Hudson Gateway MLS, otherwise known as the HGMLS. The HGMLS is owned and operated by the Hudson Gateway Association of Realtors, otherwise known as HGAR. Unfortunately, even if you are listed correctly in the HGMLS, you run the risk of being boycotted by traditional Realtors who control over 75% of all home buyer traffic. Boycotting is illegal under US anti-trust laws but is extremely hard to enforce or prove. Most flat fee brokers worsen the situation by being extremely vocal about how they’re willing to work for less and how traditional brokers are overpaid. Even worse, they often adopt extremely offensive company names that will make most traditional brokers gag. Names that are variations of “agents bye bye” or “owners only” etc. Good luck getting a buyer’s agent to show your listing with a company name like that! *The Capital Region MLS covers Albany, Schnectady, Saratoga and Montgomery Counties. The New York State MLS offers syndication and claims to cover all counties in New York, but it does not appear to be owned or operated by a Realtor association. An Agent Assisted FSBO listing is dramatically more effective than both a traditional For Sale By Owner Orange County NY listing and your run of the mill flat fee MLS listing. An Agent Assisted FSBO offers identical marketing exposure as if you had paid 6% commission to a traditional Realtor. In fact, an Agent Assisted FSBO is arguably more effective than a traditional 6% commission listing because of your ability to under price your property due to the commission savings, and as a result get a competitive edge versus comparable listings on the market. Hauseit customers are paired with a local, traditional, brand name real estate brokerage who does not normally discount. Our broker partners have bravely broken ranks with the industry and have agreed to discreetly provide private label discounts to Hauseit customers. Because our broker partners are real, traditional real estate firms, no one will know you aren’t paying full commission when your listing is mixed in with our broker partners’ normal commission listings. In fact, it’s normal practice in the HGMLS to only list what a listing broker is offering in commission to buyers’ agents. Therefore, no one will ever know that you’re paying less to the listing broker! As we’ve learned over many years of experience, people want the real thing, but they also want a better deal. It makes sense, why would you jeopardize such an important investment and life transaction by trying to sell your home yourself or with a shady discount broker. It would only make sense to get full exposure from a traditional Realtor who has good relationships with the wider brokerage community and doesn’t suffer from boycotting, and to get a private label discount if possible. Hauseit is here to help facilitate just that!